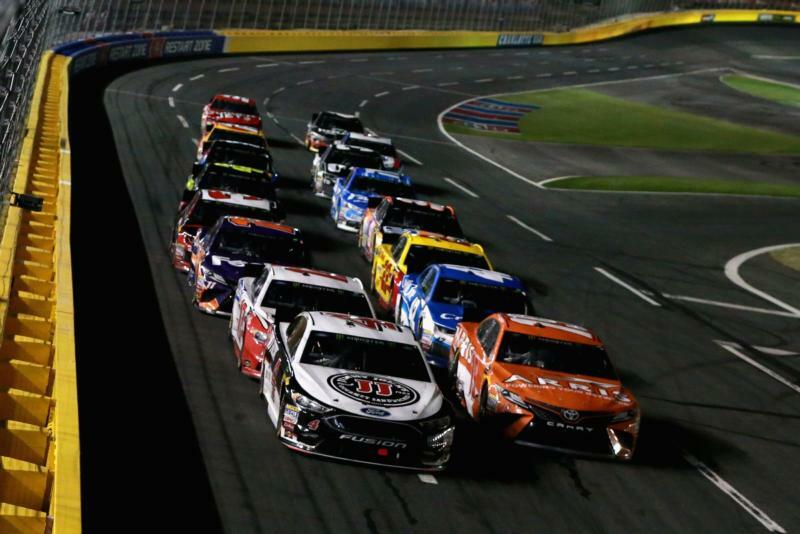 CONCORD, N.C. - Saturday night's Monster Energy All-Star Race at Charlotte Motor Speedway was like nothing we'd seen before. Well, except for Kevin Harvick winning. We've now seen that a half-dozen times in 2018. "Hey, everything's going out way," Harvick said. "We have really fast cars. Everybody is executing. "I'm proud of them all. That to me is more important than the money and everything that comes with it because everybody puts so much time with it. There's nothing better than seeing them all high five in Victory Lane." With NASCAR rolling out an experimental rules package involving restrictor plates, big front air ducts and big spoilers, the drivers were racing in a large pack similar to what you'd normally see at Talladega and Daytona. Joey Meier, spotter for Brad Keselowski, may have summed the racing up best, calling it "restrictor plate racing on a 'times 2' speed." I hope fans were entertained. It was a lot of work for everyone involved. Tons of fun to spot. At the end of the night, the majority of fans on social media and in attendance were raving about the new rules package. Time will tell if we see it again this season, which according to the charter agreement, is extremely unlikely. How Harvick won the race: With five laps to go in the final stage of Saturday night's race, Harvick appeared to have things under control until Joey Logano and Kyle Larson tangled exiting Turn 4, with Logano sending the No. 42 spinning into the infield grass. On the ensuing restart, Harvick was able to clear Daniel Suarez getting to Turn 3 and held on to score his second All-Star win, exactly 11 years after winning his first. Harvick became just the seventh driver to win multiple All-Star races, joining Davey Allison, Dale Earnhardt, Jeff Gordon, Jimmie Johnson, Terry Labonte and Mark Martin. "We're 2-for-18 now. I think that's pretty neat," Harvick said. "I feel like if I don't show up and give 100 percent, I'm not 100-percent focused, I've let them (my team) down because there's not one person in that organization that isn't giving everything that they've got every day to make sure that car is the best it can be when it rolls out of the trailer." Suarez shines: Daniel Suarez quickly adapted to the All-Star Race rules setup, winning Stage 2 of the Monster Energy Open before eventually finishing second in the main event. Although he didn't lead any laps in the exhibition, the No. 19 ran in the top five and was a force in the late going. Despite having help from teammate Denny Hamlin on the final restart, Suarez was unable to get past Kevin Harvick and settled into the runner-up spot. "I feel like we had the car capable to win the race," Suarez said. "But it seemed like you needed to have the right helper behind you, the right pusher. And Denny, he did a hell of a job pushing me all the way to the center of Turn 1 and Turn 2. "A little unfortunate, there. But we try, we run well. We ran in the top five pretty much all night, that' something to be proud of." 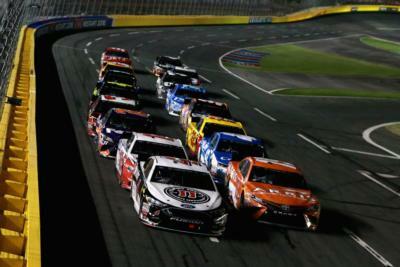 The big one collected several contenders: Typically, we don't see "The Big One" at Charlotte Motor Speedway, but with the field bunched together throughout the race, there was a sense of inevitably, especially when you consider the $1 million at stake for the winner. On an overtime restart at the end of Stage three, it finally happened. With the pack already three wide down the backstretch we quickly found out four-wide wouldn't work. Ricky Stenhouse Jr. caught the apron with his left front, getting into Martin Truex Jr. and triggering the large crash. Among the drivers involved were Stage 2 winner Kyle Busch, Kurt Busch, Brad Keselowski and Matt Kenseth. Thankfully, everyone walked away with only hurt feelings. Drivers split on All-Star rules: Following Saturday night's race, most of the drivers were quick to weigh in on how they felt about the new rules package. While several drivers didn't think it would work at every speedway, many felt it put on an exciting show and gave the exhibition event a much-needed boost. You've got to go for it when there is nothing to lose except the bag of cash. We pushed as hard as we could at the end just couldn't get clear. Hope the fans enjoyed the show tonight. Will we see this package again in 2018? That's the question that was on everyone's mind as soon as Kevin Harvick took the checkered flag Saturday. NASCAR's charter agreement requires at least six months' notice to the teams before making any major changes, and NASCAR's Steve O'Donnell said there's still plenty of work to do before they have the teams show up and install air ducts and restrictor plates again. "From an eye test, we were certainly pleased with what we saw," O'Donnell said. "I think you'll hear drivers say directionally there's some things we can look at. We agree, but would certainly said we've got to take time to digest what we saw, look at a lot of facts, and see where we go from here." When asked about implementing a rules change, O'Donnell said he couldn't put a timetable on it other than NASCAR expects to have some meetings regarding 2019. He went on to say that the new rules package created drama and uncertainty as to who would prevail at the end of the night. "I think you knew on lap seven that Kyle Busch had won the All-Star Race. I think we all knew that last year," O'Donnell said. Did you see that? In case you haven't noticed, it's been a tough year for seven-time champ Jimmie Johnson. Social Media Spotlight: Keelan Harvick's become a bit of a superstar since bursting onto the NASCAR scene. On Sunday, Kevin Harvick posted to Instagram of photo of Keelan with the All-Star Race trophy. But that isn't what Keelan cared about. Instead, he said "cool trophy, where's the money? #thingskidssay"
Bloomin' Monday: No points, no problem! Outback is still giving away Bloomin' Onions after Kevin Harvick's All-Star win! Race into an Outback Steakhouse near you and tell them you want the Bloomin' Monday special and they'll bring a free Bloomin' Onion out to you faster than Kevin Harvick turns a lap around your favorite race track. Next week: Things will likely return to "normal" in the Coca-Cola 600 at Charlotte Motor Speedway. Kevin Harvick will look to make it three points wins in a row, but a number of big name drivers are still looking for their playoff-clinching victory. The Performance Racing Network will have live coverage all weekend long, including Saturday's Alsco 300 NASCAR Xfinity Series race.